If you are in the market for a cost-effective espresso machine than this article is for you! 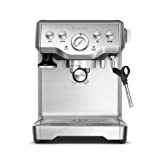 It’s more than likely that during one’s search for an espresso maker they often find machines that cost between $1000-$6000. In that, don’t be discouraged. While those machines are phenomenal, one can also find the best espresso machines under $500 that are impressive as well. Espresso Machines Under $500: What can you expect? Buying an espresso maker is one of the most exciting experiences for the coffee-lover, especially with a budget of $500. There is such a thrill in buying a high-quality and caliber espresso maker. At this point in the espresso machine industry, these machines come provided with everything you need for the perfect cup of coffee and espresso. With that being said, it is important to know the differences in the variation of prices and features to know what you are actually buying. In comparison to other products, espresso machines that are under $500 are considerably different than those more expensive. First and foremost, when it comes to these kinds of espresso machines, what you’re purchasing is a machine that can produce a high-quality espresso shot, without all of the bells and whistles that more expensive machines can provide. In fact, many espresso-loves refer to this budget as the “sweet-spot” of espresso machines. In that, each machine comes with just enough features to create the perfect espresso shot but also not too many features where the machine becomes complex. For an example, machines that are above $500 will come with features such as: touch-screen LCD displays and fingerprint identification. In the $500 bracket, you can expect machines that come with manual frothing and steaming wands, cup warming features, between 15-17 ½ bar pumps and compact and light-weight sizes. In unique machines, one might find a machine that comes with a built-in grinder feature. If this is not the case, it is imperative the user buys a market-grade grinder for their espresso. Moreover, it will be rare to find any super automatic espresso machines in this bracket; however, there are a few and you will see one of them in this article. Reflecting on the price tags and features, one of the gravest differences in the technology advancement and features. The espresso shot will be nearly the same. Many of the pressure systems that produce high quality or barista style shots will be featured in this budgeted price. With that being said, if you are seeking a machine purely for the art of a shot of espresso these are the best machines for you. This espresso machine is among the top rated espresso machines under $500. If you are an avid espresso drinker, this machine is for you. The machine, which has a list of notable features with the ability to entrance any user, is built to compliment just about any kitchen. Instead of starting with bursts of high pressure, this machine starts by applying steady, low pressure so as to expand the grinds gently. This helps in filling in any irregularities or cracks that are present in the coffee puck before the application of full pressure. By applying even pressure to all the parts of the coffee puck, an optimal flavour is extracted. This is how the machine manages to make that excellent espresso with a well-balanced flavour. For a well-balanced flavour to be achieved, the flavour has to be drawn evenly from all the coffee grinds. For optimal espresso extraction, there is an auto purge which automatically adjusts the temperature of the water after steam. Also, for even extraction, the pre-infusion function applies a low water pressure at the beginning of the extraction so that the grinds are gently expanded for the even extraction. There is a ‘Black Plastic’ insert inside the portafilter bowl made of stainless steel whose purpose is to reduce the heat loss that is usually experienced when the espresso hits the cold metal. PID temperature control which delivers water with the right temperature which is adjustable in increments of 2 degree Celsius. The Gaggia 14101 might look rugged and compact but don’t let that fool you into believing that you can’t get a great cup of coffee from this machine. The primary focus of this machine is to produce excellent espresso. Furthermore, its compact size of 14.2 x 8 x 9.5 is the best size for any kitchen. Designed in Italy by Gaggia, one of the most trusted brands in the espresso industry, Gaggia 14101 is a semi-automatic single boiler espresso machine. Since it is a single boiler, you cannot steam milk and extract espresso at the same time. You have to flip the button so that you change between the functions. Nevertheless, the brewing process can be hastened by the aluminium boiler which is highly powerful and packs out a lot of pressure necessary for speeding up the brewing process. It features a commercial grade 58mm group head, the same size found in commercial machines at your local coffee shop, as well as a 72 oz. water reservoir. Its shell is made of stainless steel with plastic handle, knobs and buttons. The combination of stainless steel and plastic keeps its price down while making it durable as well. Combining classic design and advanced technology, this espresso machine has all the benefits that a commercial coffee machine has. One of the convenient features of this machine is that it is designed to make two cups at once. Also, it has a hot-water dispenser that you can use when you want to have a cup of tea instead of coffee, a cup warmer and a frothing wand for the creation of the perfect crema. For easy filling and cleaning, the water reservoir which has a 72-ounce capacity can be removed. Nevertheless, keeping this machine is not difficult; you wipe it down using a damp cloth. 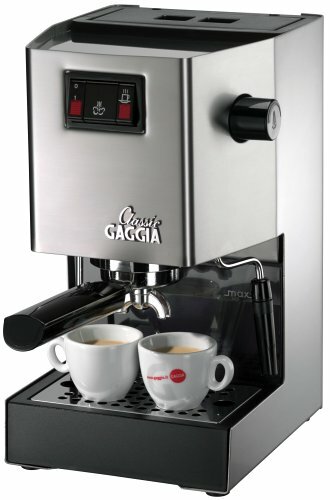 The Gaggia Classic can turn you into a ‘Barista’ in your own home. 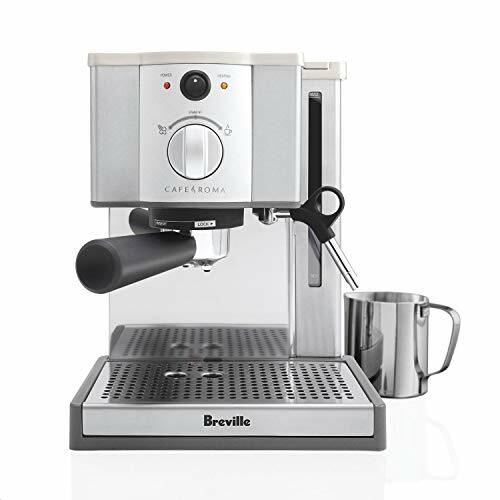 Also known as Breville Café Rome Espresso Maker, Breville ESP8XL lets you make your favourite espresso from the comfort of your home. 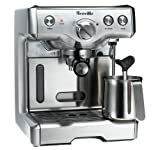 If a great espresso makes is what you are looking for but you cannot afford the espresso makers owned by your favourite café, the Breville Café Roma Espresso maker is all you need. With this machine, you will be making great espresso just like a professional barista just after using it for a short while. The excellent tasting espresso beverages made by this machine will most likely impress any of your guests. Once your guests taste the espresso that you will make them using this machine, they will most likely say goodbye to the long lines that they make almost on a daily basis at the local cafes. In fact, the long lines might migrate to your kitchen as your friends are likely to frequently visit you so that they can have the great espresso again. This cute coffee machine made of stainless steel will leave you feeling like a trained barista in your kitchen. You will feel like your kitchen is your little coffee shop. Not only do you get to make amazing espressos, but you can also make equally great-tasting lattes and cappuccinos. 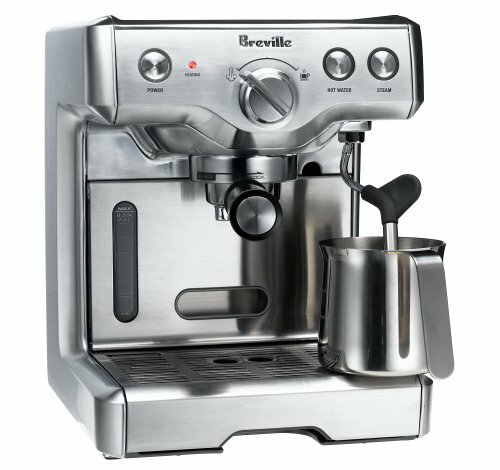 This is because the Breville 800ESXL has a frothing or steaming wand that allows you to make the lattes and cappuccinos. Also, it allows you to make up to three variations of espresso in addition to the ones that you will come up with on your own. 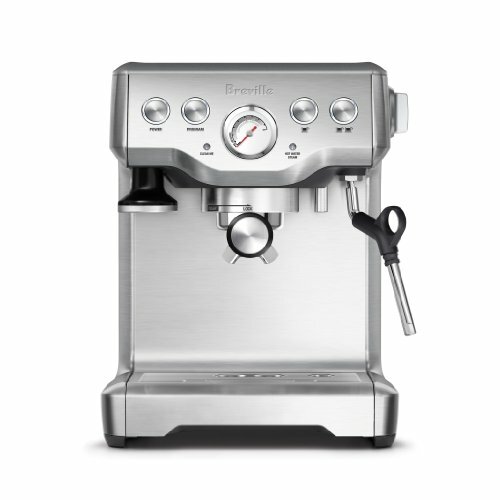 The 800ESXL is among the most popular espresso machines made by Breville. Not only is its price very affordable, but it also has a sleek design as well as 15-bars of pressure. It is no wonder most people love this espresso machine. Breville 800ESXL 15-Bar Triple-Priming Die-Cast Espresso Machine was made to impress those who have high standards for both taste and design. This machine has an elegance which sets it apart from the other espresso machines. Its stainless steel exterior and its additions which are finely manufactured create a flawless and functional espresso maker. The 15-bar pressure enables this sleek machine to produce a great shot of espresso. The stainless steel housing is not only there for the purpose of making the machine look great, but it also makes cleaning the machine very easy and provides additional durability. With all the controls being so easy to locate, making your first espresso shot won’t be a task. Creating an authentic Italian espresso has not always been easy. However, you can say goodbye to long queues at the local coffee shop trying to get yourself a decent shot of espresso because the De’Longhi America EN750MB Nespresso Lattissima Pro Machine will sort you out. Creating a perfect Italian espresso does not get easier than this. Nespresso capsules are made to take the effort and the risk away from the traditional espresso brewing and offer easy cleanup. While other pod machines need to have milk pods to achieve their frothy topping, the Lattisima Pro machine features an automatic cappuccino latte crema system that helps in createing that barista-style espresso and coffee drinks with a simple single touch of the screen. 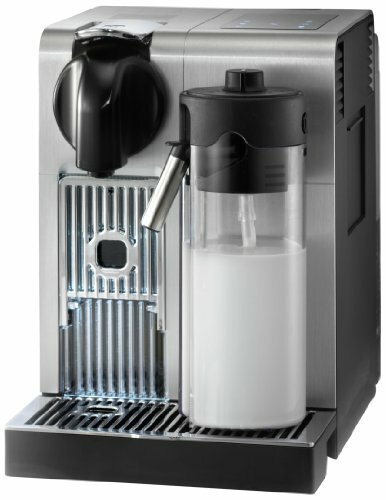 Also, the Lattisima Pro machine features a sensor touch display with six programmable drinks. The drinks are; ristretto, lungo, espresso, cappuccino, hot milk, latte as well as hot water that you use for the uncomplicated one-touch beverage brewing. The biggest lure of this small pod machine is its fresh milk carafe that features an automatic foaming function. This idea is borrowed from the bean-to-cup coffee machine models which are usually bulkier and bigger. With its premium brushed and sleek body made of stainless steel, it will be very difficult for your guests to miss seeing it when you place it on your kitchen counter. So, don’t hold back, go ahead and show off your barista-like skills to your friends and family by purchasing this machine and using it when they are around. 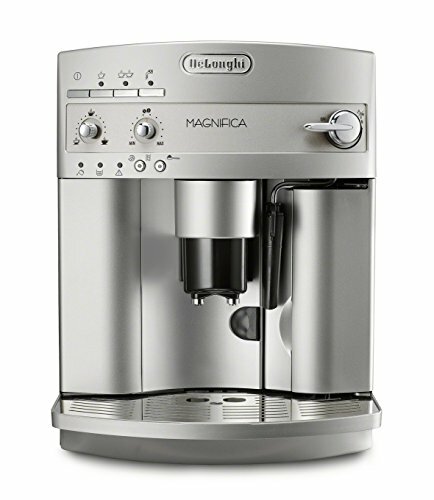 With the Magnifica be De’Longhi, you can become your own personal barista. Having this machine means that you get to enjoy delicious lattes and cappuccinos anytime you crave for them. Making authentic Italian drinks has never been this easy and fun. The patented cappuccino system frother enables the creation of great Italian beverages. What you have to do is to place the container that has milk under the nozzle to create a rich, creamy froth. Can you imagine? The Magnifica will do all the work for you. You can choose between ground coffee or whole beans; the machine does both of them. For freshest espressos, the patented direct-to-brew system grinds beans instantly before brewing. With various coffee-strength settings, everyone can get their ideal flavour. The choices don’t end there, select from cup-size options to suit your preferred taste. Other highlights include easy-to-use manual controls, as well as a cup warmer and a removable drip tray. Enjoy coffee for years to come with the Magnifica automatic espresso machine. Having looked at the best espresso machines under 500 dollars, the ball is now in your court. You are the one to decide which machine to choose from the above. Do you want a super-automatic which is more convenient or a semi-automatic machine which you can control? If a semi-automatic machine is what you prefer, then the Breville BES840XL is the one you should pick. In the recent past, features which were only found in the high-end espresso machines have migrated to the entry-level models. The result is that today, there are numerous espresso machines of high quality priced below $500. However, identifying these high-quality yet affordable machines is not easy. The people who can identify them are the ones who spend time learning about these products. Fortunately for you, you have already taken our time to learn about them by reading the above article. So the only thing left for you to do is to go out there and pick the one you like most.